How much time do your sales reps spend working on tasks other than selling? Sales productivity has become its own industry, with a legion of technological tools promising to boost the efficiency of your team. When those tools aren’t used effectively, however, productivity suffers. According to the 2014 State of Sales Productivity Report from Docurated, sales reps spend just 32 percent of their time selling. The rest goes to administrative tasks like inputting CRM data and tracking down content to include in presentations. That’s a lot of wasted time, and it’s completely unnecessary. With a focused, comprehensive plan for sales productivity, you can dramatically improve the efficiency and performance of your sales team. There’s no better place to start instilling efficient, effective sales practices than with the blank slate of a fresh batch of recruits. New reps are usually eager to succeed, which means they should be eager to learn, too. Even reps who enter the onboarding process with some sales experience will need to learn finer points of your company’s unique sales strategy. Onboarding should not be a sink-or-swim process – there’s plenty of time to evaluate performance later. Instead, focus on answering the most common questions of new reps, from where to find leads to where to find the bathroom. 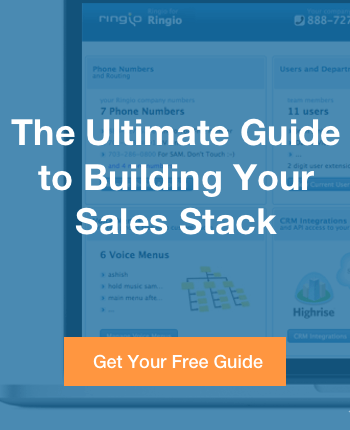 Be sure to spend time teaching any sales technology tools you expect reps to use. Sales technology is a great way to improve efficiency, but only if the technology itself is used efficiently. The important thing is having a proven, well-defined plan for onboarding reps.
CRM technology is a great way to manage business relationships, but if your sales team spends large blocks of time inputting the necessary data into the CRM, they’re not selling. Look for sales technology apps that integrate with your CRM and automate data input as much as possible. Automatically inputting sales outreaches into the CRM. Allowing users to dial directly from a CRM screen through click-to-call functionality. Recording the actual calls so that reps can review conversations to make sure they got the prospect’s intent right and managers can review the recordings to identify coaching opportunities. Using Power Dialer technology to increase the number of calls a rep can make in a given time period. This is just one example of how the right sales technology apps can focus your reps on selling, not data entry. Look for similar functionality in your chat, webinar and video conferencing technology. In the digital age, the content you offer customers often makes all the difference in whether you close a deal or lose a sale. Your buyers conduct research at every stage of the sales cycle, giving you the perfect opportunity to become a trusted adviser. This is true for both B2B and B2C sellers. The key to producing great content is collaboration between your sales and marketing teams. Your sales team’s primary responsibility is clearly articulating goals. What do your reps want your content to achieve? Your marketing team can then handle the “how” of turning those goals into a content strategy that gets results. As you develop content, pay special attention to where the target reader is in the sales cycle. It’s vital to know when to inform, when to engage, and when to make a more focused push toward a conversion. Creating content is only half the battle. The rest is making sure it gets in front of the right sets of eyes, at the right time. It’s a big job, and automation is the only way to handle it efficiently. In conjunction with your CRM, automation allows you to send content based on a prospect’s demonstrated interests, and where they stand in the sales cycle. You can also incorporate automation concepts into tasks that require a human touch by creating templates for emails and frequently used content types. When a rep needs to send an email or targeted piece of content, they simply have to “fill in the blanks” to personalize the message. Using templates eliminates wasted time, and allows your reps to send messages that have already proven to be effective. Sales and marketing overlap more than ever these days, so it’s vital to keep both groups on the same page. The content creation process is a prime example, but there are many areas where sales and marketing can collaborate to improve sales productivity. It starts with setting goals. Your funnel can only yield quality leads if sales and marketing first agree on what type of prospects you’re looking for. It’s also important to plan and evaluate marketing activities based on how they ultimately impact sales numbers. Take website visits, for a common example. A marketing initiative that increases visits by 200 percent would generally be considered successful in marketing terms, but it’s only a success on the sales side if the boost in site visits corresponds with a boost in qualified leads. Objective measurements allow you to cut through the noise, and get to the numbers that matter most. In the end, improving sales productivity is all about looking for efficiency at each step of the process. Your onboarding process should give all new reps a firm foundation from which to build success. Using the right sales technology applications keeps your reps focused on selling, not data entry. Producing your own content and automating its delivery allows you to inform your prospects, without your reps wasting time trying to find and adapt outside content that fits. Collaboration between sales and marketing improves the efficiency of two increasingly related jobs. Want to see your reps waste less time on the tedious aspects of sales? Give them the right tools, and make it a team effort.